There are two things that most Asians can’t do without. One is rice and the other is noodles. Happily, there is a low carb alternative to noodles called “shirataki noodle” which can be found in Japanese supermarkets, or in Singapore is available in selected Cold Storage and NTUC Finest supermarkets. Shirataki is made from konjac root and has zero net carbohydrates, which is a dream for low-carbers. Taste-wise it is completely neutral but in consistency is similar to “tang hoon” which is a a transluscent noodle made from sweet potato starch that is commonly used in Chinese and Korean dishes. Most shirataki noodles come packed in liquid and refrigerated. When you cut open the bag you may be unpleasantly surprised at the slightly ammoniacal odour. It took me a while to figure how to prepare the noodles so that I wouldn’t feel nauseous eating it! The best way of preparing shirataki noodles is to drain the fluid and rinse the noodles under running water. Dry frying the noodles on a non-stick frying pan over medium heat is the next step, and you will see the translucent noodles taking on a slightly whitish tinge. When making Asian dishes, I will usually add a little soy sauce and sesame oil to the noodles after removing from the frying pan and letting it sit for about 5 minutes or so. This allows a little flavour to permeate the otherwise tasteless noodles. 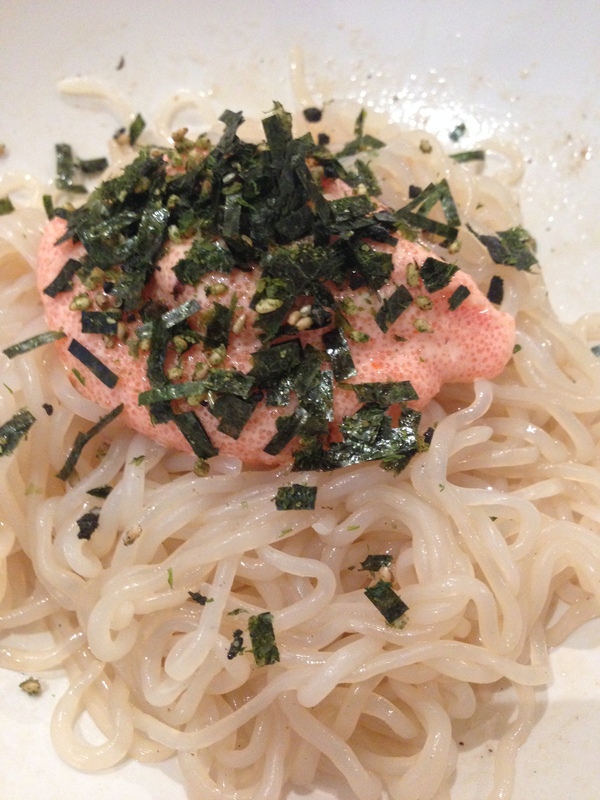 Here is a recipe I feel showcases the noodle – Mentaiko is marinated cod roe that is usually sold in Japanese restaurants. Rich and spicy, it is the perfect counterpoint to this noodle. 1. Prepare shirataki as follows: drain noodles in a sieve or colander and rinse with running water. Dry fry over a non-stick frying pan over medium heat. When the noodles look dry and slightly white, take off the heat and mix in the soy sauce and sesame oil. Toss with chopped chives. 2. Slit open the cod roe and scoop out the roe from the casing. Mix in with mayonnaise. 3. Plate the shirataki noodles with the japanese mayonnaise on top. Sprinkle over with roasted seaweed.